The flow injection analysis (FIA) supplements CE 380. It uses the photometer in CE 380 as a detector to detect the reaction product glucose. 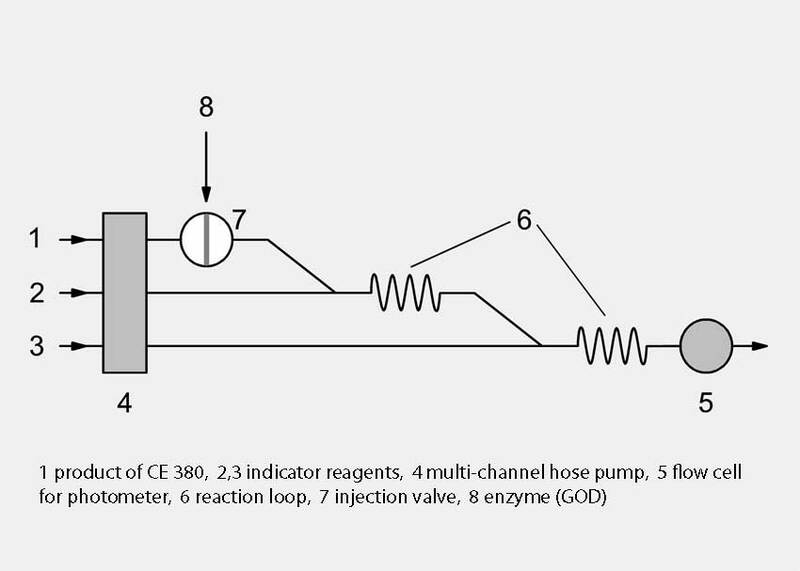 A partial flow of the dissolved reaction products (glucose and fructose) from CE 380 is continuously transported to the flow cell by a multi-channel hose pump. On the way to the flow cell a defined quantity of the enzyme glucose oxidase (GOD) is initially injected through an injection valve. Indicator reagents are mixed-in by way of other channels of the multi-channel hose pump. A discoloration occurs, which is recorded photometrically in the flow cell. The indicator reagents and the GOD enzyme are not supplied with the unit. Compared to manual analysis, CE 380.01 enables a larger number of measurements to be performed during the experiment. Moreover, reproducibility is improved and there is no longer a need to mix each individual sample. Site generate in 0.114 seconds.